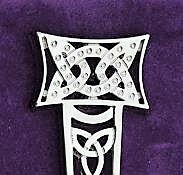 “Scottish Celtic” style kilt pin. Great value. Size approx 4″. Silver effect finish comes gift boxed. Great gift.